He should have felt the bitter cold rushing over him. The damp of the mountain air should have matted his hair in knots at the top of his head. The tunnel should have filled with the roar of his body cutting through space. But there was nothing. No ancient, dank, earthen must forcing its way into his nostrils, leaving trace minerals on his tongue as he flew. No change in pressure as he sped fast as humanly possible, faster than he had ever flown before, around bends and through crevasses he could not see. His senses depriving him of all other input, the swift twisting and sharp turns of his body were the only evidence of his path through the mountain, or his proximity to the walls, he thought, though the knowledge that he must be coming dangerously close to crashing into solid stone did not slow him in the least. An indomitable force, buried deep within him yet infinitely far away, drawing ever nearer yet never closer, urged him to fly faster still. It defied logic, yet Noel flew so fast the whipping and churning of himself as he careened onward, caused his muscles to throb and the bile in his guts to rise dangerously, stinging his throat as he pushed himself beyond his limits. In that moment, he felt more alive than he had ever felt before, which was curious because, although he could not understand why, he was certain at the end of this journey lie desperation, anguish, and inescapable death. Undeterred, he became the maddening drone of its eminent approach, the hum of potential the split second before the bolt of lightning rips free of its tethers, meeting the ground with astounding violence. Oh, the treacherous, obscure beauty of this flight, he thought, overcome by grief and joy abundant, all at once. He would beat the lightning, on this high coursing through his veins, roiling his blood. He would cut the current off at its source, relishing the absence of all else, that absence playing like a song deep within his soul. He embraced the boundless darkness. All that existed in the universe was flight. That was until the dark, the flight, Noel’s thoughts and the rest of him slammed into something curiously soft, wet, and not a part of the expanse, and Noel went tumbling furiously, wrapped up with a bundle of heaviness that felt oddly human in form, grunting as it and he rolled across the ground, melding together in an outrageous groan of feral stutters. He brought them to a stop, somewhere out of the absolute darkness that had threatened to consume him and into a darkness so insufferably bright, he dared not open his eyes for fear of searing his brain. “Fuuuuuck!” Noel cried, choking out the word, rolling himself off the mass that had softened the blow, before retching, spilling half of himself out onto the ground, the sound of his guts splattering across stone welcoming him back to his own cosmic form, followed quickly by the burning stench in his nose as he retched again, gagging over his own putrescence and the sudden, slow cruelty of reality. The fleshy bundle moved beside him. Noel squinted carefully into the unlit haze as someone else spoke from the shadows, but his head screamed with a high-pitched ringing that clung to his brain. Wriggling his fingers in his ears, he retched again even as the person beside him began to wail with deep, echoing cries, not the sort that follow physical pain, but deeper still, like the bleating of the lost. “Issssssa! Iiiiisssssaaaaa, diiiiiiiiii! Di, di, diiiiii!” the man howled, crawling on top of Noel, grabbing fistfuls of his cloak, pulling him up to face him, yelling unintelligibly, though it was clear enough he was in agony, and as he shook Noel, the heat of his words landing forcibly against his skin, burning him with every syllable, it became apparent that whatever he was on about, the man blamed him. When he was through with his abuse of him, he flung Noel angrily back to the ground, hurrying away, then fell to his knees a few yards off, to weep, lifting a lifeless body up from the ground, into his arms, holding it to his chest, rocking it close as he cried. Noel rolled up on his side and forced himself to sit, stunned, not at all certain he had not accidentally killed someone, barreling out of the abyss as he did. Beyond the man he saw a small group of people had gathered. His vision was still a blur, so he could not tell how many were there, but he counted at least six of them, of various shapes and sizes, none terribly large, none of them as distraught as the man who wept before them. “I am sorry,” Noel said, his voice barely above a whisper, knowing his words meant nothing to these people, but hoping his intentions might be understood. As the man lay the body back on the ground and scrambled to his feet, Noel tried to brace himself, but set his hand down in a puddle of warm slime. The man came toward him, hand outstretched, yelling, “Khip fI! Khip fI!” as Noel hurriedly wiped his hand on his cloak, stopping only as he bent down to look Noel in the eyes, panic, despair and guilt distorting his dark features. It was the man who had rescued him from the avalanche. A fierceness filling his eyes, Noel’s rescuer ripped the rucksack from his shoulder, shoving him to the ground again in the process. But the man pushed Noel’s hand away, turned his back, and tore the bag open, dumping it on the ground, muttering, “Khip, khip…Ta dzer tmAama,” as he knelt over the contents, rifling through them in search of something important. The man shrugged Noel’s hand away and kept searching. Noel looked up at the group of people still standing over the body. There were five men of various races, two women and a young girl. None of them made any effort to help. Not one of them, not even the ancient woman or the girl, seemed at all bothered by the lack of any sign of life from the person lying on the ground in front of them, nor were they moved by the frantic search of Noel’s rescuer. He gathered his strength and pushed himself up onto his feet, taking a few careful steps forward, testing his balance on his weakened limbs, but as he got confident in his staggered gait and looked over, to see how far he had left to go, a jolt of panic ran through him. It was the woman—the woman who had helped to save him—the woman who had been the very stuff of his hallucinations in the belly of that mountain, tangled up inside his head in the abhorrent darkness. Noel had heard her cry out his name in terror. Stumbling over himself, he ran to her side and fell down over her body, expecting the worst, after all, he had flown with such tremendous speed out of the veil of blackness—flying to her, he now realized, an afterthought that made the gravity of the situation that much worse, because he was certain the force of their impact had caused her serious injury. Wishing he had not used all of the Iachaol on himself, he turned her body toward him. His mouth fell agape, horror seizing him. The rot of death had taken her right arm. Necrotic webs stretched across her chest, up her neck, in veiny fingers until it reached her still beautiful lips, tinged with aubergine, contorted open in a final, savage wail of silence. His throat constricted. His stomach tightened. He could feel the shadow of her dead fingers clutching his. He could taste the sweetness of her mouth. There was no air anywhere. Gasping, tears spilled from his eyes as he bent down, pressing two quaking fingers against the artery on her neck. There was no pulse, but he had not expected one. Shaking off the remorse welling up inside him, he leaned his cheek over her face, hoping for even a whisper of air to escape those poor, tormented lips, but it was useless. By the looks of her, she had been dead long before they met, but that was impossible. She had been very much alive the night she helped save him, and her friend acted as though her death had only just occurred. Noel could not fathom what had done this to her. Or perhaps he understood exactly what was responsible, and he knew he had barely escaped. Panting eagerly, Noel’s rescuer fell swiftly to his knees before him, empty blue vial in hand. He was speaking fast, foreign words already incomprehensible, now little more than noise drowned out by a half-dozen other voices arguing as Noel stared blankly at the corpse lying before him. He had been here before, staring into those still onyx eyes. He had tried to save the vision of her in the darkness, but she had turned to dust in his arms. The man reached over and shook him by the shoulder, holding out the vial, pleading with him, but all the Iachaol in the world would not bring this woman back to life. Only Noel could do that. As he tilted the woman’s head back, plugging her nose between his thumb and finger, Noel wondered how he would explain the events that had unfolded there in that mountain to the elders at Fendhaim, how he could possibly make them understand that he had been guided to that place, how he had nearly died finding his way, his encounter with the abysmal shade that had ensnared his mind with thoughts of this woman, or how he managed his escape only by speeding blindly through the darkness—to her. No one would believe he had seen into the future, or that he knew that this very moment was his chance to change it, to return Isabella to her rightful place. But it was better not to think about that now, and just to breathe… As she wanted… So she might live again. Noel took in a deep breath, pressed his mouth tightly over hers, and exhaled, hearing her petrified lungs crack and grind as the air moved through them. Shivering, he wiped the grit from his mouth, but before he could take a second breath, a stabbing pain caught him in the chest, sending him flailing backwards several feet across the ground, as angry voices grew louder, echoing off the cave walls. Coughing against the pain burning deep in his lungs, holding his stomach, Noel rolled up onto his knees, preparing to answer the next blow with whatever energy he could muster, but that blow never came. The eldest man of the five now stood between Noel and the women, his arms outstretched as though to protect him. But the young girl spoke to him with vehemence, ducking her head swiftly beneath the man’s arm and hurrying over as another man, who Noel was certain was Isabella’s father, sat reluctantly on the ground next to his rescuer, taking the vial from his hand, pulling out the stopper with his teeth even as the girl took his arm, imploring him not to do whatever it was he intended. Ignoring her pleas, the man ran his finger over the rim of the vial then touched it to his tongue. “Breathe, Noel,” Isabella besought, the ghost of her stronger than ever. Shuddering, Noel clamored across the ground, returning to her side. “Breathe,” Noel and Isabella said as one, Noel nodding, feeling his eyes widen, afraid of admitting to himself the impossible idea that had taken root inside him. A flux of energy crawling over his flesh, he leaned down to attempt once more to save Isabella, but the elderly woman raised her voice in protest. How she had seen him, he did not know because she was clearly blind. Ignoring the warning, but keeping an eye on her, in case the old man did not have her under control, Noel took in a deep gasp of air. He watched as the middle-aged woman took her blind elder’s arm, as though to lead her safely out of the tunnel. 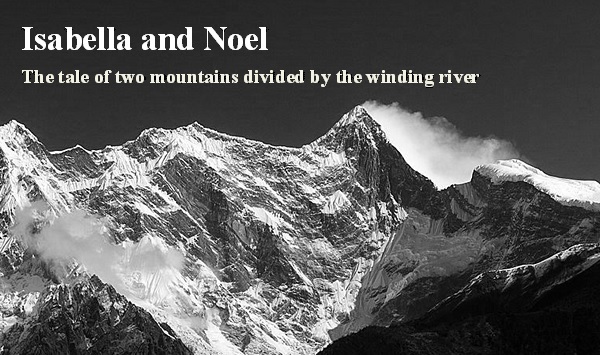 Instead, the two of them disappeared in a swirling cloud of black, a magic the likes of which Noel had never seen. The young girl had been busy whispering gentle words of caution in Isabella’s father’s ear, but as soon as the others left, she looked to Noel and smiled, not the smile of a child, but a wise smile that hinted of a greater understanding of things than Noel could possibly grasp. He was still holding his breath as she disappeared as well. Noel pressed his mouth to Isabella’s at last, breathing deeply into her, this time watching her chest and diaphragm expand. Noel had felt Isabella leave his body, the spectral mist of her lingering over his tongue, sweet as an almond blossom. The twitch of her fingers a moment later confirmed it. He got slowly to his feet, swearing to himself he would never speak of this to anyone, not to the elders, not to Phileas—not even to Isabella, assuming she lived. Never, he thought, turning away to return his things to his rucksack, perplexed, knackered, not looking back, not when he heard his rescuer’s happy exclamation, not when he heard Isabella’s quiet, torturous moan.